I was recently approached to do an interview and photoshoot about A Blonde Ambition with Celebrate Arkansas Magazine for their July issue and, (of course), I said yes! It was released yesterday and I couldn't be happier with the finished product. In addition to getting to talk about the blog, I also got to visit two of my favorite stores in Fayetteville and choose pieces to be spotlighted in the feature. You can check out the digital version here! A special thanks goes out to the lovely and oh-so-talented Jena Anderson who coordinated and wrote the article, photographer Jason Hudson and the team at Celebrate. 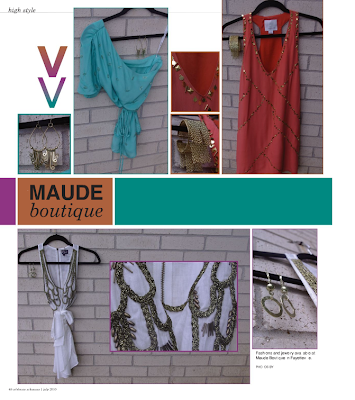 Also, a big thank-you to Maude and Lola Boutique! And lastly, but most importantly, a BIG "gracias" to you amazing readers. You guys continue to rock my world more and more everyday. That is so exciting, congratulations!! OMG you look freaking fantastic... and that is just absolutely awesome!!!!! Can you tell I am excited for you!!?? Congrats lovely lady... well deserved that's for sure! Wow, that is fantastic! You look amazing!! How exciting! You look beautiful :) I have that dress but in brown and yellow and just love it! Congratulations, Leslie! The picture of you is so so cute! Congrats! I just started reading your blog and I love it!! Oh my gosh! I'm SO happy for you! This is awesome! (i'm going to be dining with a celebrity in July :)!) Great job! wow congratulations!! that is such a wonderful opportunity! how fun! Congrats -- you're officially a star now! Congratulations - you're a STAR! So exciting! That's awesome! We leave for Arkansas tomorrow, so I'll have to find an issue while I'm there! Congrats girl! WOW!!! BIG, huge, ginormous congrats!! You look soo adorable as well :-D Way to go! Wow, this is awesome! And can I just say that you look fantastic! Congrats! Congrats!!! Thats so exciting for you! I love the dress your wearing in it. I have tried to order it from modcloth twice and it's been sold out. that is SOOOO neat and you look gorgeous! what an amazing opportunity Leslie! congratulations! This is amazing! You look fabulous! So exciting Leslie!!! I would absolutely die if I was asked to be featured in a magazine! The dress you're wearing is perfect...love the one shoulder and two tone color! I had to stop by again to let you know I mentioned you today on my blog! Hope you're having a great night! Congrats! I'm so glad it turned out so well! Thanks for the shout out Leslie! It was an honor to work with you. 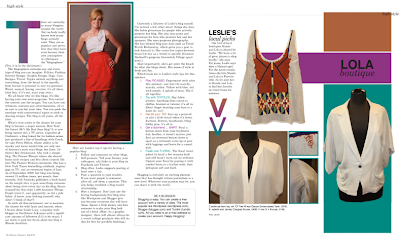 We would love to have you in the magazine again from time to time! Keep up the great blogging! Thank you SO very much, Jena! Of course I'd be honored to do anything for you guys in the future! So grateful for this opportunity! So awesome!! It's so great to be recognized not only for something you are good at but something you love too!! Keep up the amazing work. OMG this is so exciting! I am thrilled for you! CONGRATULATIONS! This is so freaking cool! I am so impressed! You look a-freaking-dorable! I cant wait to go read the story right....NOW! Ahhhhhh I'm getting caught up and this is incredible! Congratulations you look amaaaaaaazing!